Although Latvia remains a land of unrealised potential for many international producers, directors and actors, the feedback from those who have collaborated with local production companies, and have actually filmed in Latvia. is overwhelmingly positive. Shooting in Latvia was as professional as it is in Germany or in France. I really liked Riga, I found it very Northern. I like the fresh air and the old brown stone buildings. If you’re looking for breathtaking undiscovered locations, Latvia can offer you a broad range of eras and moods within a comparatively small territory. Here, you’ll find monumental medieval fortresses, refined aristocratic houses, and huge deserted behemoths of Soviet industry. There are very interesting and impressive locations in Latvia. The craftsmen and technicians, as well as the local acting talents are the equals of any in the world. Latvia has played various roles in films – the streets of Riga have played those of Warsaw, Berlin, London, Zurich and other European cities. Meanwhile, the Kurzemes coastline has doubled as Normandy on D-Day, Kuldiga has been a small town in Poland, and the forests of Latgale have imitated German-occupied Soviet territories during the Second World War. I would like to thank the talented and professional film crew that worked with me in Latvia. Their experience made it possible to shoot the film in a very short period of time. We understood each other perfectly. Besides the fact that film production costs in Latvia are much lower than those in Western Europe, Latvia’s governmental and municipal bodies offer international film production co-financing of up to 50%. I’d be absolutely thrilled to return to Riga and I’m sure that many other film crews will be visiting soon. I shall certainly be telling people what a fantastic time we had there. Check out the wealth of options that Latvia offers you! Accessibility, convenience, professionalism of local film crews, and low risk – this is how foreign producers describe the filmmaking opportunities in Latvia. This view of the filmmaking process in Latvia can actually be empirically verified and has become even more true in 2017, when a great number of co-financed projects were implemented in Latvia. In fact, two films recently filmed in Latvia (co-financed by the National Film Centre of Latvia and using the services provided by Film Angels Studio) premiered at the Cannes Film Festival: Sergei Loznitsa’s A Gentle Creature in the In Competition section and György Kristóf’s Out in the Un Certain Regard section. The available co-funding in Latvia has remained stable at approximately EUR 2.5 million, when taking together the resources of the National Film Centre and the Riga Film Fund. However, considering that nowadays nearly all European countries offer co-funding modules for foreign film productions, it’s clear that the availability of financial resources (up to 50% of a film’s production expenditures accrued in Latvia) is not the most important factor in making decisions. So why do project leaders return and confidently state that they want to film again in Latvia? The producers from Film Angels Studio and Tasse Film, the two studios most actively involved in European projects in Latvia in 2017, explain why. They begin by saying that the expectations of foreign filmmakers working in Latvia for the first time are often exceeded – they are frequently surprised by the professionalism of local crews and the reasonable costs in the country. Aija Bērziņa and Alise Ģelze, the producers at Tasse Film, stress the great variety of locations available in Latvia as one significant aspect of foreign projects’ interest in the county. “Riga has a very well-conserved and authentic historical environment. Furthermore, the city has a certain Nordic flair, and in many places the architecture looks quite Scandinavian,” says Bērziņa. Together with Ģelze, her co-owner at Tasse Film, Bērziņa produced the coming-of-age drama Mellow Mud (directed by Renārs Vimba), which won a Crystal Bear at the Berlinale in the Generation 14 competition in 2016. Currently, the two young women are not only helping local film directors make their ideas come true; they are also actively involved in foreign film projects being filmed in Latvia. They have had a busy autumn – between September and November they were involved in three nearly consecutive film productions. When asked how a comparatively small company like Tasse Film manages such a large work load, Bērziņa and Ģelze explain that they’ve refined their working procedures and develop a precise schedule for each project, which ensures that things move forward smoothly, quickly and independently. They also point out that it is easy to get all the required administrative permits, which facilitates the process. In addition, neither Riga nor other locations in Latvia are overloaded with film crews, as is sometimes the case in other European capitals and can lead to delays in filming. Although covering only an area of just under 65,000 square kilometres, Latvia offers a range of diverse environments that have been “left behind” by various different foreign powers over the centuries. Here one can easily find the right filming location for a variety of moods and historical eras. For example, film crews from neighbouring Russia and projects involving storylines placed in a (post)socialism setting often choose Latvia because of its Soviet architectural heritage. Recently Tasse Film was involved in the filming of The Humorist (a co-production between Russia’s Metrafilms, Czech Republic’s Sirena Film and Tasse Film) in the Latvian resort town of Jūrmala. Journalist Michael Idov’s debut as a film director is an autobiographical tale set in Jūrmala in the mid-1980s and tells about a Soviet comedian and the decline of his career. Though Jūrmala has kept up with the times, it still possesses an air of the past, from the wooden architecture typical of the late 19th and early 20th centuries to the Dubulti railway station, which is a distinctive example of 1970s modernism. 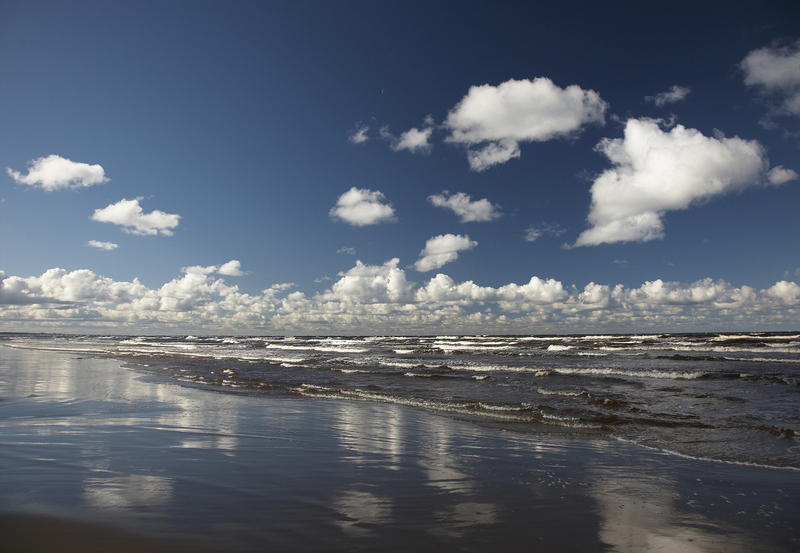 The sites reminiscent of Jūrmala’s time as a Soviet-era seaside resort also offer intriguing filming locations. The Sonata – a supernatural thriller directed by Andrew Desmond that is a co-production between France’s The Project, Great Britain’s Featuristic Films, Russia’s CTB Film Company and Tasse Film – also recently explored Latvia’s potential for historical locations. It was shot in various locations all over the country, including castles in varying states of preservation from the Neo-Renaissance and Neo-Gothic eras. It is noteworthy that the production of The Sonata included a number of renowned local professionals, for example, cinematographer Jānis Eglītis and costume designer Rolands Pēterkops (MAREUNROL’S). The third foreign production Tasse Film was involved in this year is Czech director Michal Hogenauer’s relationship drama Outside (a co-production between Czech Republic’s Negativ Film Productions, the Netherlands’ Circe Films and Tasse Film). Latvian artist Laura Dišlere was also a part of the production team. Bērziņa and Ģelze stress that it is important to them to be part of the creative processes of film projects. Both participate also as co-producers and evaluate potential cooperation projects carefully, taking into consideration their artistic qualities and potential to appeal to audiences. Carine Leblanc (a producer at France’s Slot Machine) and Gunnar Dedio (a producer at Germany’s LOOKS Film & TV) also stress the high standards of local Latvian producers. Leblanc and Dedio previously worked with the experienced Latvian production company Film Angels Studio (established in 2002) while shooting Sergei Loznitsa’s A Gentle Creature in the Daugavpils area. They recently returned to Latvia to film the TV series Age of Iron, which tells about the Thirty Years’ War, one of the most destructive conflicts in European history. When meeting them on Day 15 of the 20 days they had allocated for filming in the iconic Riga Cathedral, the producers told me that, as when making their first film here, they were pleasantly surprised by the Latvian team’s professionalism and efficiency. “People here do things without verbosity, everybody knows the task entrusted to them,” said Leblanc. Their successful previous cooperation and the positive dynamic they experienced in Latvia were a significant factor in the producers’ return to Latvia for filming. If companies like Slot Machine and LOOKS Film & TV, whose wide scope of work, regular international activity and filmography are well recognised in venues such as Cannes, come back to Latvia for their productions, that is a strong indicator of the high level of quality of the services available here. Thus the small Baltic country’s competitiveness on a European level increases from year to year. Returning to Age of Iron – of course, the availability of locations appropriate for a 17th-century setting played an important role when selecting Latvia. Leblanc and Dedio say, only half-jokingly, that the unrenovated state of some historical buildings plays right into the hands of the film’s artistic needs and authenticity. Dedio points out another advantage: much shorter distances between filming locations than elsewhere in Europe. Within half an hour one can get to very diverse locations, or, for example, to the airport. Both producers express their interest in returning to Latvia with a new project. However, they believe that the creation of a co-financing fund could further increase interest from abroad (currently the National Film Centre supports minority co-productions with EUR 300,000 annually). Dedio also believes that visibility would be further increased if Latvian partners put forward more cooperation projects in which the story actually takes place in Latvia. This would complement the current practice, in which Latvian locations are used to replicate other European landscapes and architecture. Tasse Film’s Aija Bērziņa and Alise Ģelze are convinced that Latvian cinema professionals have the capacity to deal with an influx of foreign projects while ensuring the same level of quality and efficiency of services. They elaborate that the available infrastructure is most suited for European projects – both films and TV series, which has become a very promising genre. Film Angels Studio’s producer Jānis Kalējs agrees that at this stage it is not yet realistic to ensure the infrastructure and services required for large-scale Hollywood productions. At the same time, it should be mentioned that a number of substantial non-European projects have recently chosen to film in Latvia and use the services of Film Angels Studio, for example, the Chinese production Chinese Zodiac and the South Korean film My Way. Representatives of both Latvian studios share the view that the professionalism and competence of local teams increases noticeably with each project, thus expanding the range of available professionals. Latvia’s centenary film programme also contributes to an increase of human resources. A total of 16 cinematic works are being produced in the framework of this programme, including two feature-length animation films, which is a previously unexperienced level of production in Latvian film history. As part of the production process, new on-set professionals and animators are being trained, which will further increase Latvia’s capacity to work with local and foreign cooperation projects. Total amount of co-funding from the Latvian state and support from the Riga Film Fund: approximately EUR 2.5 million; applications for co-funding can be submitted all year long. films (including animation and documentary films) are intended to be shown in cinemas or on television. Tenders are held once a year in May. For a bilateral co-production, the financial investment of the Latvian side must be at least 20%, for multilateral co-productions it must be at least 10%. A collective of Central Baltic organisations has received a €2m European Union funding grant to promote the region to international film productions. Dubbed North Star Film Alliance, the initiative combines companies and agencies from the Estonian, Finnish and Latvian film industries. The grant comes from the Interreg programme, which is funded by the European Union’s European Regional Development Fund. North Star Film Alliance is led by Estonia’s Production Services Export Alliance – the company behind the €6m production facility project Tallinn Film Wonderland – and it is partnering with the City of Helsinki and the Film Services Producers Association of Latvia. Associated partners are the Estonian Film Institute, the National Film Centre of Lativa, and Finland’s Tekes funding agency – the three organisations that govern the individual countries’ film tax credits. One of the goals of the initiative is to promote those tax credits, to help international producers understand and access the credits, and to potentially allow them to access all three on a production. Ultimately, the key aim of the venture, which will cover a three-year period, will be to attract more international film productions to the three countries involved. North Star Film Alliance plans to put a focus on targeting productions from Canada, USA, Japan, South Korea and China. One of the initial parts of the project overseen by North Star Film Alliance will be to commission a market analysis of Estonia, Finland and Latvia, to highlight what the region has to offer to international productions, and what current weaknesses can be addressed. The organisation said that the region’s current strengths are: Finland’s experience and technical capacity, the upcoming Estonian studio complex and highly digitalised business environment, and Latvia’s existing backlot and reasonable cost level. For its seventh edition, the Locarno Festival’s First Look initiative (4 – 6 August) turns the spotlight on Baltic Cinema. Thanks to a partnership with the Estonian Film Institute, National Film Centre of Latvia and Lithuanian Film Centre, this year’s First Look will present 6 films in post-production chosen by the Locarno Festival. The works in progress will be accessible to industry badge holders only. Before each screening the producers and directors will introduce their film to the various international sales agents, funders, distributors and festival programmers. Nadia Dresti, Deputy Artistic Director and Head of International: “The Locarno Industry Days are the perfect place to give the right visibility to a specific activity. First Look is an excellent opportunity for the countries in focus to highlight their cinema. Thanks to the tailor made program designed by Project Manager Markus Duffner, we are sure that the selected Estonian, Lithuanian and Latvian producers will profit from the Locarno experience. Nobody can be sure, especially in these days, to sell a film, but we can assure that the films will be seen by buyers, festival programmers and other professionals in town, as well as by a high profile jury”. On August 6, the jury, composed by Charles Tesson (Cannes’ Semaine de la Critique’s Artistic Director), Janet Pierson (SXSW Film Head) and Sylvain Auzou (Venice Days’ Vice Director) will be handing out an award worth 65,000 euros in post-production services, sponsored by Cinelab Romania, as well as an award worth 5,500 euros in advertising, donated by Le Film Français, and the Boogieman Media award (5.000 € value for the production of a Key Art). Baltic View and Noir Lumiere will hand-out three inkind awards (consisting in DCPs and international promotion) valued 3000 € per film. The producers will also access a special matchmaking service provided by First Look Project Manager, Markus Duffner. Pardi di Domani Jury member – Kristijonas Vildziunas (Lithuania). Previous editions of First Look have focused on Colombia, Mexico, Chile, Brazil, Israel and Poland. The official programme for the Cannes Film Festival has just been announced, and it includes two films co-produced by and filmed in Latvia: Sergei Loznitsa’s A Gentle Creature in the official selection, and Slovak director György Kristóf’s full-length debut Out in the Un Certain Regard section. Both films were made with assistance from the team at Film Angels Productions and co-production funding. Nineteen full-length films have been selected for the official competition in this 70th-anniversary year of the Cannes Film Festival (May 17–28). They include the newest works from François Ozon, Andrey Zvyagintsev, Michael Haneke, Sofia Coppola and other directors. This will be the third time a film by Loznitsa will have competed at Cannes. His previous entry was In the Fog (2012), which received the FIPRESCI award and was the first film he shot in Latvia. Having enjoyed the advantages of filming in Latvia and the highly qualified and talented film professionals working in the country, Loznitsa returned to Latvia with his next project, for which he received co-finansing from the National Film Centre of Latvia and the Riga Film Fund and support from the Film Angels Productions studio. The feature film A Gentle Creature is based on motifs from a story by Fyodor Dostoyevsky. It was filmed in the summer of 2016 in and near the Latvian city of Daugavpils. The main producer of the film is the French company Slot Machine; also participating in the international co-production were companies from Germany, Russia, Lithuania, the Netherlands and Ukraine. Slovak director György Kristóf’s debut film Out has been selected to compete in the 16-film Un Certain Regard section, which will open with Mathieu Amalric’s newest film, Barbara. Kristóf’s film is the story of a middle-aged Slovakian man who heads to Latvia for work but is dragged into a series of absurd events. The film is a co-production by Slovakia, Latvia, France, Hungary and Czech Republic. It was filmed in 2015, and a few later scenes were shot in Slovakia and Hungary. Kristóf and his Latvian wife, Ieva Norvele-Kristóf, are both graduates of the FAMU school in Prague, Czech Republic. Norvele-Kristóf served as the director’s first assistant for Out, but she also acted in the film and is the reason why most of the film was shot in Latvia. The filming of this project in Latvia was also supported by Film Angels Productions, and most of the filming group in Latvia consisted of local film professionals, such as art director Aldis Meinerts, production director Elīna Zazerska, casting director Brigita Lībiete, lighting specialist Juris Zemītis and many others. Out also features Latvian actors Guna Zariņa, Ieva Aleksandrova-Eklone, Kaspars Pūce, Varis Klausītājs, Kaspars Bindemanis and others. In fact, Latvia is linked with one more film in the official Cannes competition lineup. Andris Keišs, an actor at the New Riga Theatre, plays in Zvyagintsev’s feature film Loveless. Locarno’s work in progress section First Look will celebrate the 100th anniversary of Baltic Cinema showcasing not yet completed Latvian, Estonian and Lithuanian films, for an audience of professionals attending the Industry Days. Baltic Cinema Industry has seen a constant growth in recognition in the yearly festival circuit: 2016 Berlinale Chrystal Bear winner Es esmu seit (Mellow Mud) by Renars Vimba, Tangerines by Zaza Urushadze (nominated at the 2015 Oscars), and I’m Not From Here by directors Maite Alberdi and Giedrė Žickytė. Several Baltic directors have attended the last edition of the Locarno Festival: Laila Pakalniņa, Maris Saadi, Ilmar Raag, Heilika Pikkov among others. “The Locarno Industry Days are the perfect place to give the right visibility to a specific activity. First Look is an excellent opportunity for the countries in focus to highlight their cinema. Thanks to the tailor made program designed by Project Manager Markus Duffner, we are sure that the selected Estonian, Lithuanian and Latvian producers will profit from the Locarno experience. Nobody can be sure, especially in these days, to sell a film, but we can assure that the films will be seen by buyers, festival programmers and other professionals in town, as well as by a high profile jury ”, says Nadia Dresti, Locarno’s Deputy Artistic Director and Head of International. Thanks to the invaluable support of the National Film Centre of Latvia, Estonian Film Institute and Lithuanian Film Centre, First Look 2017 will select from 5 to 7 films in post-production stage and with no sales agent attached to be screened to an audience of buyers, festival programmers, post-production support funds representatives and sales agents attending Locarno’s Industry Days. The aim is to start the films’ international career and help their completion, enhancing a dialogue between the professionals and the producers that will introduce each work in progress briefly before each screening. “The Latvian National Film centre is very pleased to participate in the First Look section, which represents a great opportunity for the Latvian film industry to highlight its production boost – 16 new features – for Latvia’s centenary programme”, National Film Centre of Latvia, Dita Rietuma. The 70th edition of the Locarno Festival will held from 2 to 12 August 2017. Further information on First Look.